Many people think that children are always active and cheerful and do not have mood problems as adults do. In fact, some children and teenagers always feel anxious, restless or depressed, but they may not be able to express their feelings clearly. It may hinder them from seeking the right treatment. Let us know more about children and adolescent mood disorders and help those in need earlier. 1. What are child and adolescent mood disorders? 2. What are the symptoms of depression in children and adolescents? 3. What are the causes of depression? 4. What will happen to them if they grow up? 5. How to treat adolescent depression? 6. What is anxiety disorder? What is the difference between anxiety disorder and ‘normal anxiety’? 7. What are the symptoms of those common anxiety disorders in childhood or adolescence? 8. What are the causes of anxiety disorder? 9. What will happen if my children with anxiety disorder grow up? 10. How to treat anxiety disorder in children and adolescents? The common mood disorders in children and adolescents include depression and anxiety disorder. Depression is rare in children, but becomes more common in adolescence and more prevalent in female. 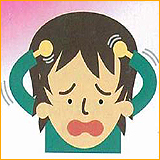 Anxiety disorder is a common name for all disorders related to anxiety. The most common anxiety disorder in children and adolescents include separation anxiety disorder, specific or social phobia and generalized anxiety disorder. About 3-4% children and adolescents suffer from anxiety disorders of all kinds. This is very rare to have bipolar affective disorder in childhood. Children and adolescents with depression are just like the counterparts in adulthood. They had at least 2 weeks history of low mood, irritability, loss of interest, disturbance in sleep and appetite, fatigue, psychomotor retardation, poor concentration, excessive guilt or sense of hopelessness, suicidal idea or acts. Some of them may have more severe symptoms such as delusion or hallucination. But due to their communication problems, they may not be able to tell others clearly about their feelings, but present with changes in daily routines, such as deterioration in academic performance or interpersonal relationship. These behavioural changes may not be noticed by others. The usual parenting technique would not help if we miss the underlying depression. Family history of depression increases the risk of depression in children and adolescents. Other environmental problems such as poor family relationship, poor social support, life events or some automatic negative thoughts would also cause depression. Over half of them will have chance of relapse, likely related to the environmental factors. Minority of them may become bipolar affective disorder. It is important to minimize the chance of relapse as depression is closely linked to suicide. It requires multidisciplinary approach and involves their parents, teachers and peers. Family and social support is very important. Cognitive behavioral therapy can help to change their negative thoughts and antidepressants may be necessary in those severe cases. Anxiety is a complex mixed state of apprehension, restlessness, worries and fears. It is common to have some physical symptoms when the person is anxious, such as palpitation, increased heart rate, dizziness, shortness of breath, sweating, shivering, epigastric discomfort, diarrhea, etc. Actually, everyone may have anxious feeling to some particular occasions or people, e.g. during examination or performance. This kind of anxiety is temporary and is normal reaction. However, if the symptoms are more severe and persistent, and affect the daily lives, social or academic functioning, then the children or adolescents may suffer from anxiety disorder. The most common anxiety disorder in children and adolescents include separation anxiety disorder, specific or social phobia and generalised anxiety disorder. Children with separation anxiety disorder always worry the significant adults (usually the parents or caregivers) may leave them or having accidents. They are unwilling to separate from adults. They refuse to go to school and do not sleep or stay at familiar places without adults’ accompany. They also have frequent nightmares related to separation or a lot of physical complaints. For those with specific phobia, they will be anxious and avoid some particular occasions. Children and adolescents with social phobia fear of facing strangers. They will be embarrassed and over-cautious about their own behaviours in front of strangers and attempt to leave these occasions. For those with generalised anxiety disorder, they cannot figure out the exact cause of anxiety but always complain of restlessness, apprehension, fatigue, poor concentration, difficulty to relax and insomnia. Family history of anxiety disorder, anxious-prone personality, pessimistic or catastrophic thinking patterns would increase the risk of anxiety disorder. Sometimes, anxiety disorder is precipitated by some triggering events such as change of school, examination stress, physical illness or separation of parents, etc. It may also occur after a significant psychological trauma. Some physical problems (such as endocrine problems) or drug use may cause symptoms of anxiety too. Most of them have reduction of symptoms or even complete recovery if the precipitating factors disappear (e.g. getting used to new school). For those with more optimistic thinking patterns or coping skills, they will recover even faster. If parents notice their children have the abovementioned symptoms for more than four weeks and there is impairment in their academic or social functioning, then they should seek help from psychiatrists or clinical psychologists. The most common treatment includes psychotherapy, behavioural therapy and medication (such as selective serotonin reuptake inhibitors). Family support and understanding is also very important.